Yesterday, Barb Wooler, director of crisis response for Encompass World Partners, posted this information. 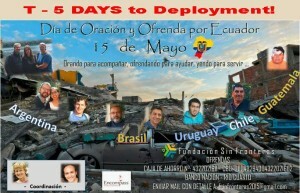 Grace Brethren ministries in South America are partnering to provide help following a powerful earthquake that struck April 16 along the Ecuadorian coast. Grace Brethren people from five countries will join for this effort. In just 5 days a team will be arriving in Ecuador to care for people in deep need as a result of the powerful 7.8 earthquake that struck Ecuador’s coastal area last month. This team is comprised of 11 team members from 5 Latin American countries including Argentina, Brazil, Chile, Guatemala, and Uruguay. TODAY’S PRAYER EMPHASIS: Please pray for the team members as they prepare for their trip. This is the first time most have ever done something like this, and though they are excited and ready to serve, they may be experiencing some “butterflies”. Pray for confidence. Peace. And pray that each team member will be able to raise the balance of the funds they need for their team (all airline tickets have been purchased; the rest of their support will go towards their needs (food, lodging, etc.) on the ground. Unless otherwise specified, any funds given through Encompass will go towards the ministry of the team, which will be providing for physical, emotional (trauma) and spiritual needs of earthquake victims. We are grateful to be partnering with these brothers and sisters as well as with the evangelical church with whom we will be serving in Canoa, Ecuador.